This technique will teach you how to make the dough with no fuss. For a heartier, robust flavor, you can substitute the 2 1/2 cups of strong white flour with 2 1/4 cups of whole-wheat flour. 250 ml (10 fl oz - 1 1/4 cup) of lukewarm water (body temperature is best) Yields 4 pies. 2 Sift flour and salt together in a bowl. Stir in the sugar. It is important to mix the dry ingredients first. Dissolve the yeast with the water, set aside for a couple of minutes. 3 Pour the yeast water and oil gradually into the flour. 4 Knead the mixture to make soft dough. 5 Tip the dough onto a lightly floured surface and knead for 5 to 10 minutes until smooth and elastic. If you are using a food processor, run the machine for 1 minute. Add the dry ingredients first, then gradually add the liquids, Start at a low speed, and move up slowly. Always stand close to the food processor while it is running. 6 Place the dough in a large bowl, dusted with extra flour. You can also use olive oil to grease the bowl. This will prevent the dough from sticking to the surface of the bowl. Cover the bowl with a damp kitchen towel and leave to rise in a warm place free of air drafts for 1 1/2 hour to 2 hours, or until doubled in bulk. I usually place my dough to rise in the cool oven. 7 Punch down the dough. On a floured surface, form a rope-like shape. 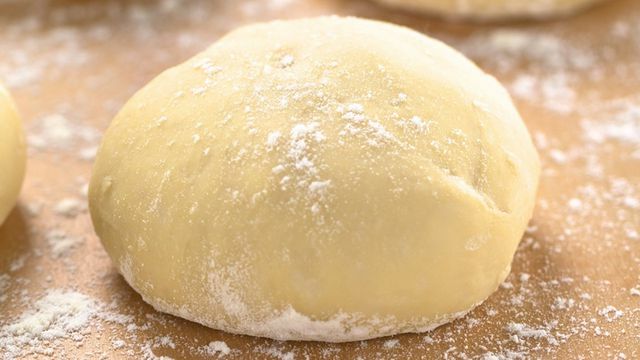 Pinch off the dough to form equal sized balls. Flour a bowl and leave balls to rise for an additional 1/2 hour. 8 Flatten each ball with your palm. 9 Roll out each ball of dough, with a rolling pin, into a circle of about 10 inches (25 cm) and a thickness of 1/4 inch (6mm). 10 Spread the dough on baking pan, if you are using the conventional oven.